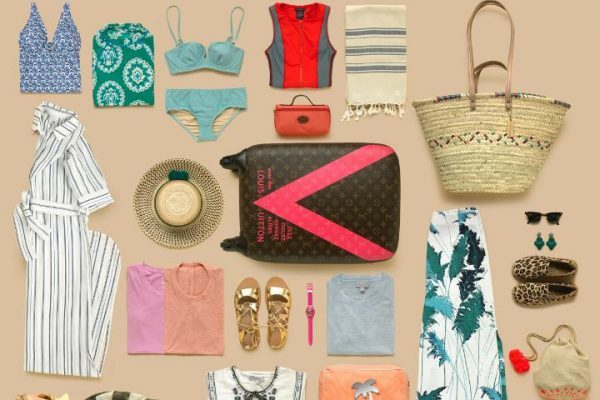 If you tend to associate the word ‘carnival’ with warm weather, palm trees, and Caribbean islands, it’s time to consider a few other options, especially if you happen to live within Europe. Every year, Basel welcomes over 100,000 tourists to Fasnacht– Europe’s largest (historically) Protestant carnival. 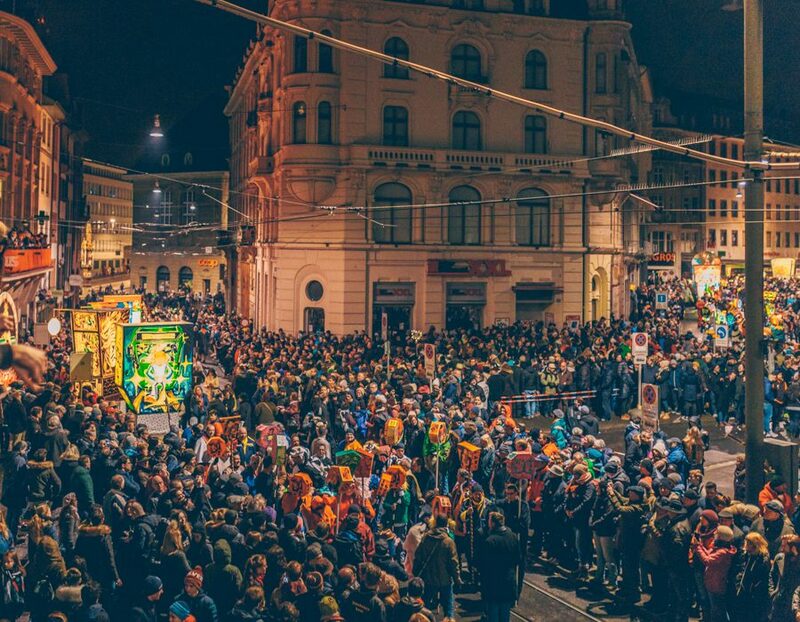 #TeamCoco’s travel and food writer, Eulanda Osagiede is sharing why Basel’s Fasnacht may be one of the few cold weather carnivals to get you booking your ticket today. Basel is located near the German border of Switzerland, hence their use of Swiss German as the national language. However, using English or French will serve visitors to the city sufficiently. Fasnacht runs for three consecutive days the week after Ash Wednesday, commencing with the spectacular Morgensteich; where the lights of the city are replaced by the glow of beautifully designed lanterns. 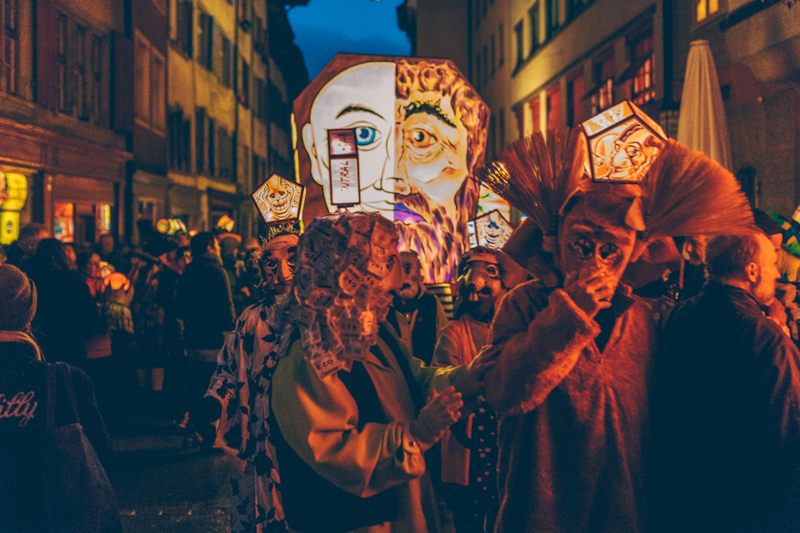 Thousands of masked performers carry these lanterns through the streets of Basel at the command of drum majors. This year’s Fasnacht will be held the 3-5 March, so wrap up, put on your dancing shoes….better yet, your wellies since it’s likely to snow or rain. Mounds of festive and colourful bits of paper are everywhere. In local tradition, the maskers that man the floats will shower onlookers with flowers, sweets, and plenty of confetti. 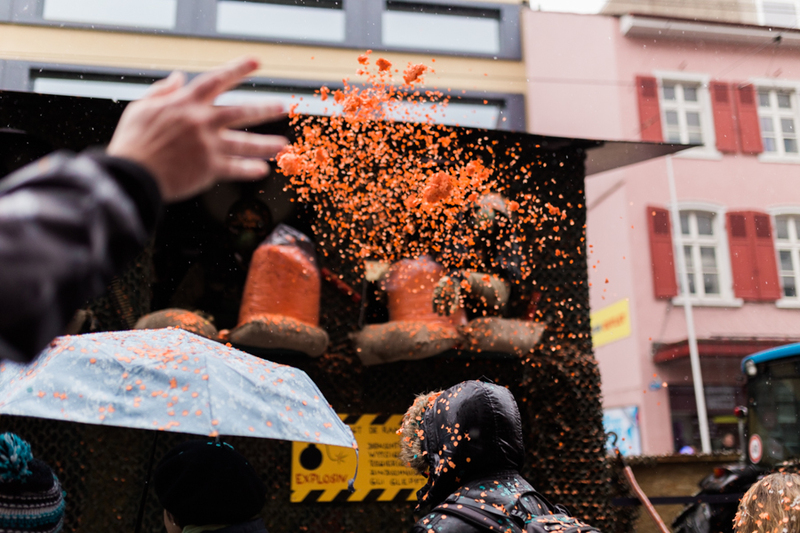 However, it’s not only thrown from floats, children and adults of all ages will surprise an unsuspecting onlooker with a generous handful on top of their head, or down the back of their jacket if they don’t move quick enough. It’s difficult to avoid, so don’t attempt to, because your efforts to do so will be laughable at most– trust me. When I returned home from three days of celebrations, my husband helped pick varying sizes of colourful bits from my hair for two days straight. I could have been a revamp of a life-sized 80’s doll. Push her button and confetti shoots from her head. If you’re attending Morgenstreich at 4am on Monday (which I highly suggest you do), get ready to move your feet quickly as small processional groups (known as cliques) seemingly appear out of thin air throughout the alleys, passageways, and streets in the city. It will be your job to move out of the way, so do be ready with a few twirls here and there. You could be standing still in a passageway, mesmerised by one large group marching through the streets in their cliques, and the very next minute, you’re quickly moving out of the way for several small groups coming your way in varying directions. Brush off those moves, and get comfortable with dancing in the dark. Make sure to have your cameras sans flash, as it distracts the masked performers. 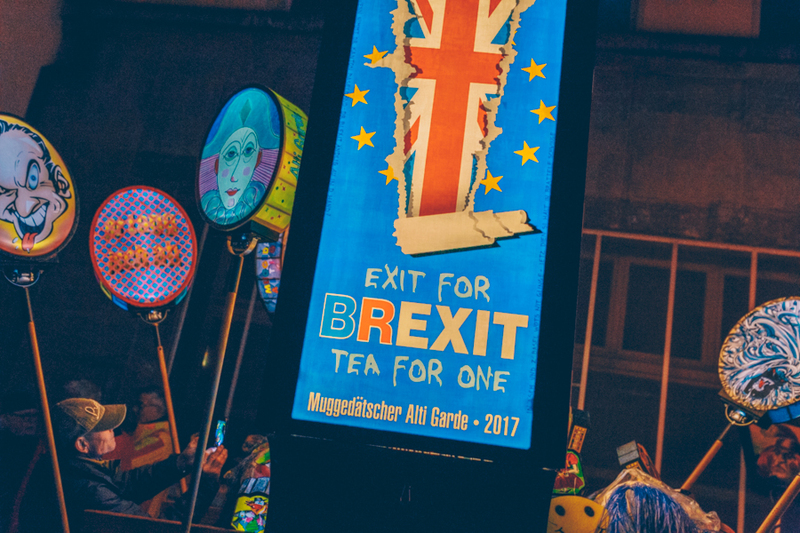 One fascinating aspect of Fasnacht is the array of heavily satirised political messages displayed on floats, props, and lanterns. Even if you’re not fluent in the Basel dialect that most Fasnacht signage is written in, it’s quite easy to ascertain the humour, irony, and sometimes parody behind the messages. Left or right? It doesn’t matter, every side has a place in Fasnacht’s parodical spectrum. After seeing lanterns with caricaturistic representations of Brexit and the American presidential election, you wonder if your own home country should adopt the approach of some of the biting wit of Fasnacht. Basel’s primary food culture is a distinct fusion of Swiss, German, and French influences. Traditional Fasnacht specialities include Basler flour soup, cheese & onion tarts, Basler Leckerli (gingerbread style biscuits), and the thumb length, hazelnut filled sweets known as Mässmogge. Of course, I’d be remiss not to mention the abundance of raclette, fondue and rostis. 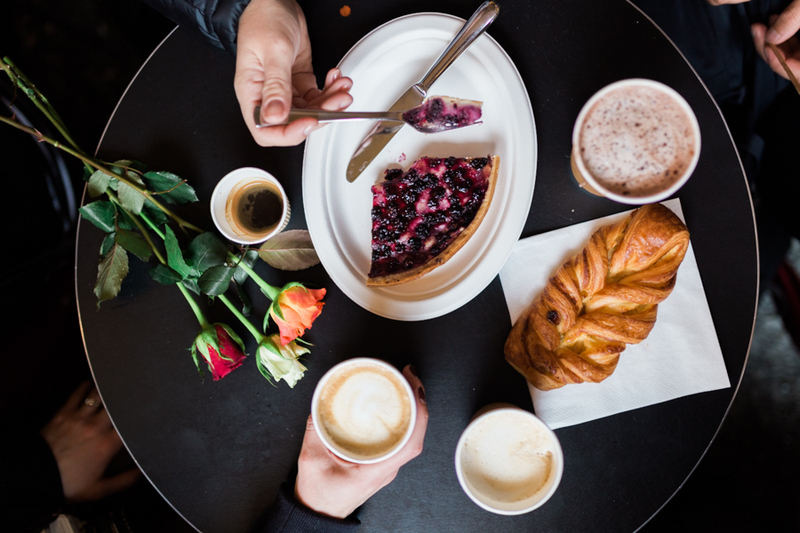 However, if you prefer to start your Basel journey with a coffee, head to the Instagram-worthy Cafe Fruhling in Kleinbasel, after starting your day indulging in a lush breakfast spread at Swissôtel Le Plaza Basel. That is if you actually want to get some sleep. If you roll with the ‘no sleep’ crowd, you’ll be in perfect company. 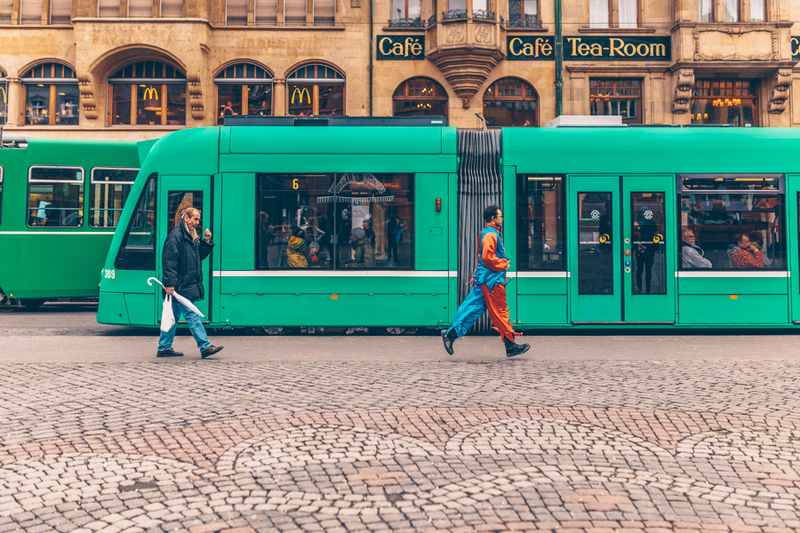 I stayed at Swissôtel Le Plaza Basel, which was a ten-minute tram ride away from the city centre. Although the majority of footfall happens nearer to Marktplatz in the city centre, I often found myself woken up to piccolo and drum music throughout the early hours of the morning. I couldn’t help but groggily laugh every time it happened, however, not everyone may find it so pleasant. 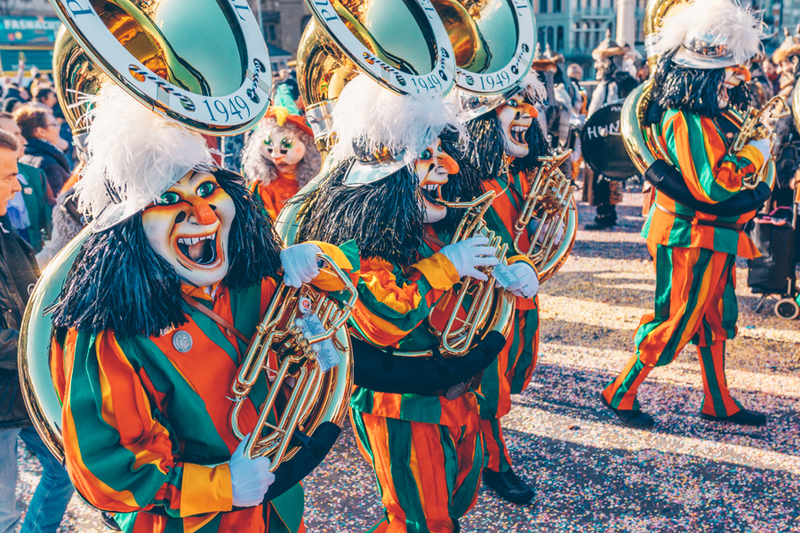 The Fasnacht musicians practice year round in preparation for the festivities, so it’s safe to say, don’t come to Fasnacht if you’re not ready to hear a vibrant mix of piccolo, drum, and occasional Gugge (brass band) music for a consecutive seventy-two hours. Three Best Days of the Year? Fasnacht is a riot of colour, textures, sounds, and beaming spirits. Despite its marked difference from warm weather carnivals and festivals of similar nature, Fasnacht has its own unique place among the brood due to it’s creative mix of history, humour, and satirical connection to current global events. No wonder Baslers hail Fasnacht as “die drei scheenste dääg” (the three best days of the year). Like all carnivals around the world, Fasnacht is a beautiful celebration of local culture and community– a festivity that we can all raise our glasses to. Three night stay in Swissôtel Le Plaza Basel begins at £350. For more information visit www.swissotel.com/hotels/basel. Before booking accommodation, ask your hotel if they are along the parade route if you’re concerned about an undisturbed sleep. 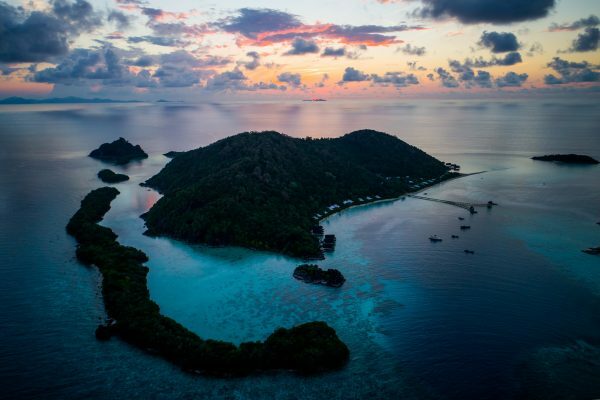 Travel & food writers exploring the sights, tastes, and stories of the world. Interests: Wine Lovers. Foodies. Africa. Blog Curators. Foreign Films. House of Cards. Luxe.